9 reasons to buy a 4K TV (and a few reasons not to) | What Hi-Fi? If 2014 was the year 4K TVs became mainstream – albeit with sky-high prices and enormous screens – 2015 is the year it becomes a seriously viable option. And a compelling one at that. The pixel-packing screens – with resolutions of 3840 x 2160, four times that of the 1080p Full HD sets that have been part of the household furniture for the past decade – are out in force in 2015. They are now dominating manufacturers' line-ups in a range of sizes and prices, with curved or flat physiques (or both in the case of some flexible screens). Back in the early days of 2012, 4K aroused much suspicion... Would it survive? Could it realistically become a mass-market successor to Full HD? Three years on, it’s safe to say 4K TV has probably secured its place in the future of home cinema. And now is a better time than ever to see what the fuss is about. Here's our round up of the reasons that now might be the time to take the plunge - and, because you never know what's round the corner, a few good reasons that you might want to keep a watching brief. First and foremost, there’s no denying that 4K takes picture quality to new levels. It’s all in the detail – quite literally. Delivering eight million pixels instead of a Full HD panel’s two million, Ultra HD TV sets are noticeably more insightful when fed 3840 x 2160 material. You really can see the nitty-gritty details in faces and the textures of objects. Couple that with the fact sets are making headway in others areas – sharpness, colour, contrast – and the result is an immersive, eye-popping picture. And that's before we mention high dynamic range (HDR). There’s enough content now (we’ll get to that later) to give 4K TVs a fair trial, and we’re well and truly won over as far as performance goes. 4K TVs have never been this affordable. The first generation of 4K sets, which went on sale in 2012, came in the shape of whopping great, and not cheap, screens from the likes of LG, Sony and Toshiba. More sensible £4000-6000 screens arrived in 2013, with 2014 bringing that down to £2000. And now you don’t have to open your wallet even that wide; 2015 sets are more affordable still – and not just those from cheap Chinese brands, either. There’s a handful of 4K sets under £1000 (from 43in LGs and Sonys to 55in Polaroid and Finlux sets). Of course, pull-out-all-the-stops flagship ranges from the TV giants remain lavishly priced - but even these rarely exceed the £4000 mark. And you can always pick up some decent TV deals on last year’s batch – you couldn’t say that last year. There aren’t just more 4K TVs out there, but more screen sizes to choose from, too. No longer does buying one mean having to accommodate 55in (or bigger) screens. 40in seems to be the popular starting point this year (both Panasonic and Samsung have sets from around £800), with 43in, 48in and 50in sets closely following. Who’d have thought 4K might make it to the bedroom already? Gone are the days when 4K content was limited to promotional flower and cityscape clips. Or even just a trickle of video streaming. Now we can almost binge-watch 4K. Almost. Last year saw Netflix paving the way for 4K streaming (first there was House of Cards: Season 2, followed by Breaking Bad and its own Marco Polo series) for those willing to pay £9/month – £2 more than the standard subscription. And Netflix is continually adding to that list, with 4K films and TV series forecast throughout this year and next. Amazon Prime Instant Video followed suit with a host of TV shows available to £6-per-month-paying Prime subscribers at no additional cost. A catalogue of 26 films and counting is available on a pay-per-view basis. That inventory is on the climb, and the good news for 2015 is that the app no longer features just on Sony sets, but is rolling out across LG’s and Samsung’s line-ups too. YouTube is also expanding its 4K offering, and many 2015 TV sets will support the Google VP9 hardware decoding required to play it. More importantly, most (if not all) of this year’s sets will also meet the HEVC (High Efficiency Video Coding)/H.265 compression standard needed to stream 4K content, from Netflix for example. Even last year this wasn’t the case, so those who jumped the gun and bought non-HVEC-compliant sets might be out of luck. Though we’re still some way off getting live 4K TV broadcasts, there are certainly plans afoot. 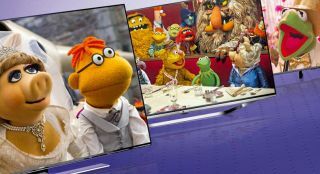 First, the BBC has said it aims to broadcast 4K as ‘standard’ by 2016, following a comprehensive survey that found 23 per cent of users would benefit from 4K broadcasts right now. And on the pay TV side, both BT and Sky are rumoured to be preparing to launch 4K set-top boxes before the end of 2015. It won't happen overnight and there may not be an instant flood of content, but it's clear that broadcasters think the market is now right to make the first step. Ultra HD Blu-ray is coming this year. The final specification has been confirmed by the Blu-ray Disc Association and players and discs are set to be revealed at IFA in September to go on sale in time for Christmas (we have already seen a prototype from Panasonic at CES 2015). And it’s not all about resolution: the discs will support another one of this year’s buzzwords, HDR (high dynamic range) technology, as well as improved colour gamut and bit depth (from 8-bits to 10-bits per channel). Go close up to a Full HD set and it will look pixelated; you’ll detect some picture noise (ie. graininess). Not with a 4K screen; you can watch from any distance – even nose-to-the-screen close – and, provided you're playing 4K content, it will look clean and noise-free. Why is this good? Bigger screens in smaller rooms without hurting your eyes, that's why. We found the first generation of 4K sets didn’t handle high- or standard-definition content very well – a real blow when 4K content was pretty much non-existent and that was all you could watch. Thankfully, the latest models seem to have addressed this issue, so the questionable quality of EastEnders or your favourite DVDs and Blu-rays is no longer a barrier to buying one. Choose wisely and your favourite TV shows and movies should look just as good as they would on a Full HD screen, even if the TV makes up three out of every four pixels to fill its real estate. If you’ve bought a flagship smartphone (or a high-end camera) in the past year or so, chances are it can film 4K video. So any 4K content gap can be filled... by yourself. The award-winning Sony Xperia Z3 is one such 4K-toting smartphone. What better way to watch your cat clips than in native 4K on a big screen? Sold! Yes, content is on the up, but in the grand scheme of things, high definition is, and will be for the foreseeable future, the overriding resolution. It will be an age until we see a number of 4K channels on our sets, and as for 4K Blu-rays, no doubt they’ll be expensive and you will need a new player. There is also the question of how much bandwidth streaming requires. The UK’s average home broadband speed is less than 20Mbps, but Netflix asks for a minimum of 25Mbps to stream 4K video. There are, however, plans to try to combat this with new compression technology. You don’t need new cables to carry these higher bandwidths, but your TV, Blu-ray player, A/V receiver or soundbar – in other words, every link in the home cinema chain – does need to support HDMI 2.0 and HDCP 2.2 (a copyright protection standard) for them to shake hands with one another. A lot of manufacturers are coming onboard this year, so most new kit should be compliant when it arrives, but those with older AV kit may well require an upgrade. Too small to see the difference?